I have been using this router for 2 full years now. I use it daily in a large router table for anything from routing mouldings to doing raised panel doors. Don't let the 1 3/4 hp fool you. It has all the power of the big guys. I have routed everything from soft pine to hardwoods such as oak and birch and have never had a problem with the machine bogging down. The easy finger latch makes it quite easy to change the bits. All of the bits I own are 1/4 shaft so the collet size is fine for me. If I need to move up to 1/2" shafts then I will consider a bigger router. The plunge action in the router is superb. It is smooth and the spring action is very durable. The only drawback to the router is that it doesn't have a micro-adjustment on it like most routers in it's category. This makes it especially hard to use on a router table (although the experts say you shouldn't use a plunge on a table). But this tool has proven itself time and time again and I do not regret purchasing it. I was looking for a simple router that could do amateur routing. 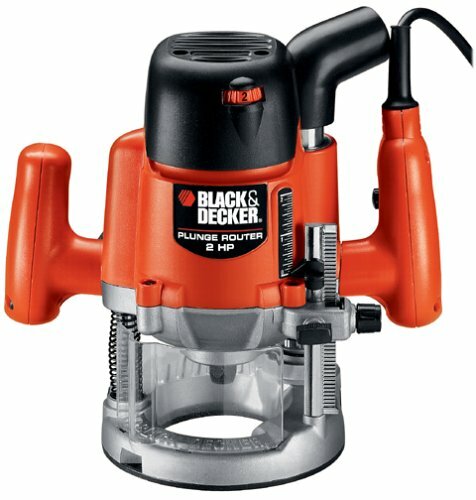 I wasn't looking for the expensive industrial 1/2" bit router. This router is the best value that I could have chosen, and I have been very impressed by it. The soft start and variable speed features are very helpful while the depth stop is amazing. You can stop it at any depth and pretty easily change to another depth with a built in ruler. One of the only problems I have found so far is that the line of sight can be bad when the router is down and unless you have good lighting, it is hard to see the bit to line things up sometimes. Another of the minor problems is that it is a bit heavy, but this only gets in the way when putting it into a router table, which you do not need to remove from the table to remove the bit. 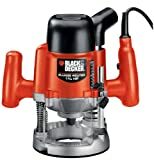 In another review, the person said that the router did not have attachments, but Black and Decker now makes the edge guide that works really well with the router. All in all, this is a great router and a great price for everything you get. 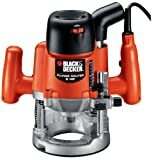 Black and Decker is the brand for you. As a neophyte woodworker without any guidance, I thought this was a solid brand. After mowing through various B&D drills, sanders, etc, I have seen the light. These are hobbyist tools. Unlike my other B&D purchases, I had time to return this one before I found out how lacking it was. This router couldn't spin any decent sized bits and bogged down easily on hardwoods. I would have to do miniscule increments on every cut. On top of that, the plunge mechanism would slip repeatedly. Returned it and bought another brand that I won't mention as this review is to warn you off this one - not sell another. This is a decently designed router. The handle is pretty comfortable, the switches work well and feel nicely designed, and the dust extraction is great. It seems to have plenty of power, and the plunge action is very smooth. However, it has a couple of fatal flaws. First, the base is not compatible with template bushings, and no one makes a compatible baseplate, although there are a few clear acrylic ones that you could drill your own holes in (patwarner.com and Lee Valley sell them). This may not seem important initially, but if you continue to work with the router, you will almost definitely want this ability. Second, most other common attachments aren't compatible either, like the Jasper circle jig or an edge guide. Most router companies make their own edge guides, but not B&D. And all the common aftermarket guides aren't compatible either (for example, the Microfence). This won't be too much of an issue if you use this router in a table though, which I didn't do. Third, it only has a 1/4 inch collet. It seems to have enough power for a 1/2 inch collet, and lots of other routers in this power class have the capability, although not necessarily at the same price. As an entry level router in performs its duties well. The 1/4" collet grips well, and bit changing is quite smooth. The dust collection is a great feature borrowed from it's distant Dewalt cousin. The depth stop is easily set and easily locked. The trigger and lock on the handle is very easy to use as well. It is also very powerful. The downsides of the router: it is a little on the heavy side though still easily manageable. There is no way to adjust depth when it is in the table without your own modifications. A little loud.